The Skinny: Standard triad drama that hits its marks efficiently. However, one typically expects more from an Andy Lau film. Triad action drama from Wong Jing features Andy Lau as Fei-Lung, an aging legendary triad who’s been straight for years. 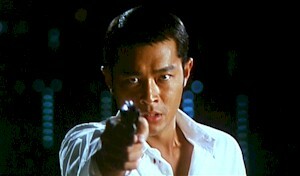 Shadowing him is his right-hand man, Sing (Louis Koo), who’s really an undercover cop assigned to watch Fei-Lung. As is typical with this stuff, Sing has developed a respect for Fei-Lung and doubts his current involvement in anything shady. However, everything is brought to a head when Hung Hing head Pao (Anthony Wong) is injured, leaving a void in the group’s top spot. The men all went Fei-Lung to lead them, but he doesn’t want back in. Enter Man (Patrick Tam), Pao’s son, who decides he wants Hung Hing to be his and proceeds to double-cross everyone to achieve his goals. Simultaneously, Sing is hounded by an embarrassingly evil new superior officer who proceeds to act like a complete idiot and threaten his own men at every turn. When certain terrible events take place, Fei-Lung must decide whether to go the triad route and wreak revenge on Man, and Sing must decide whether he can take down his own boss.